Where to find Rosseau hotels near an airport? Where can I find hotels in Rosseau that are near tourist attractions? Expedia has no accommodations listed in Rosseau, but there are 3 accommodation options that are within a 0.1-kilometre (0.06-mile) drive. The closest Expedia-listed hotel is the JW Marriott The Rosseau Muskoka Resort & Spa, Ontario, located 11 kilometres (7 miles) from downtown Rosseau. Another alternative is the Windermere House, situated in Ontario, which is 15 kilometres (9 miles) from Rosseau. The Rocky Crest Golf Resort is positioned 9 kilometres (6 miles) from the main part of Rosseau. 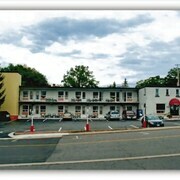 Another accommodation option is the Sherwood Inn, which is situated 18 kilometres (11 miles) away. The Quality Inn & Conference Centre as well as the Muskoka Shores Cottages are other alternative places to book accommodation around Rosseau. After seeing Rosseau, take a little time to investigate the wider region of the Southern Ontario area. Photograph Southern Ontario's beaches and coastal plains. You could also head to a few of its traditional villages. Common pastimes in this particular part of Canada include skiing, cross-country skiing and snow shoeing. Looking for more to do? Spend some time exploring Muskoka Bay Golf Course and Taboo Golf Course, in Gravenhurst, 45 kilometres (28 miles) to the southeast of Rosseau. The Residence Inn by Marriott Gravenhurst Muskoka Wharf and Howard Johnson Inn Gravenhurst are some of the hotel alternatives in Gravenhurst. 55 kilometres (34 miles) to the east of Rosseau, is Dwight, home to the Logging Chain Lodge Cottages and Dwight Village Motel. Regardless of whether you're passing through or spending a few nights in Dwight, a couple of places to add to your itinerary are the Dwight Beach and Marsh's Falls. Before you say goodbye to Huntsville, ensure you experience some local sport. 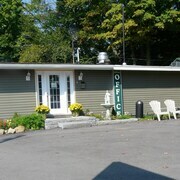 Visit Eastview Arena to the south of Rosseau. 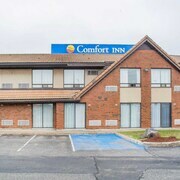 For those who are interested in booking a room nearby, make a reservation in the Holiday Inn Barrie Hotel & Conference Centre or Comfort Inn And Suites. Located 120 kilometres (76 miles) from Rosseau is Jack Garland Airport. Stay nearby at Hampton Inn by Hilton North Bay or Comfort Inn Airport. 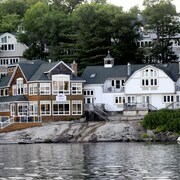 What are the most popular Rosseau hotels? Are there hotels in other cities near Rosseau? 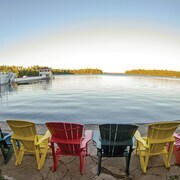 What other types of accommodations are available in Rosseau? 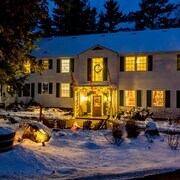 Explore Rosseau with Expedia.ca’s Travel Guides to find the best flights, cars, holiday packages and more!